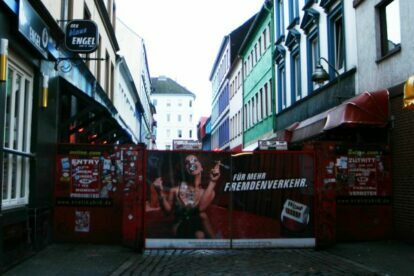 Behind big red walls is the most sinful street of Hamburg. Around 250 women work there, sitting in shop windows, waiting for any male walking the only 60 m street. It’s probably the most polarizing street ever. Here the history in short: In horrible times of National Socialism there was a prohibition on stripteases and prostitution. But in St. Pauli they couldn’t eliminate the typical business. So it was only allowed in one narrow street – Herbertstraße. To let nobody see what is officially forbidden, the head of Nazi district built barriers on both ends in 1933. Since 70’s there have been big signs forbidding women and teenagers under 18 years to enter.